This is a Tamiya-Italeri Series model kit based upon the Italeri 1/35 Field Work Shop kit. This set has newly-molded parts, plus Tamiya figures, accessories and instruction manual, all packaged in a new Tamiya box! It can be constructed into a diorama by itself, or used in conjunction with products from Tamiya"s huge range of German vehicle model assembly kits to create a highly realistic diorama scene. Special Feature 1 Features workshop equipment parts which are a product of Italeri. 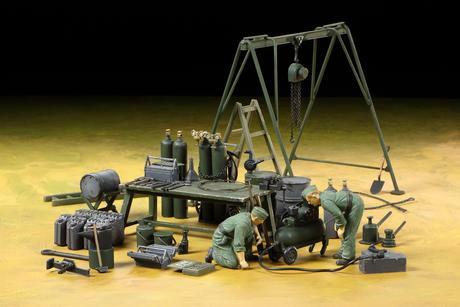 Special Feature 2 The Italeri kit features an A-frame crane, workbench, fuel drums, compressor, gas canisters and much more. A-frame hook and hoist sections have been newly molded as separate parts for this kit. Special Feature 3 Includes a wealth of Tamiya accessories including enamel wire, fine metal chain for A-frame, 2 figures (1 squatting and 1 with hands on knees, tools, fuel drum, ladder, 12 jerry cans, jack, tool boxes, and more!